Data source: Occupancy rate and inpatients discharges/ death from Hospital Authority (2005-2006), HKSAR; Population statistics from Census and Statistics Department (2006), HKSAR. 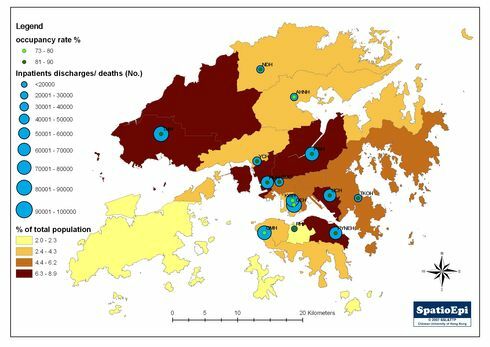 Map shows the relationship between occupancy rates, inpatients discharges and deaths in major public hospitals and population by district in Hong Kong during 2005- 2006. Occupancy rates are represented by either bright green dots (73- 80%) and dark green dots (81-90%). Inpatient discharges and deaths (in numbers) are expressed in graduated symbols (light blue circles), the sizes of which being proportional to the rate. The graduated colour of light yellow to brown are used to show the proportional distribution of the population by district. In this map, a high hospital occupancy rate does not necessarily mean high number of discharges/death. Similarly, districts with higher population may not have a high occupancy rate and/ or discharges/ deaths in their hospitals. One of the reasons is that patients may seek medical service across districts, as the nearest hospital may not be the district hospital. On the other hand, public hospitals are grouped in clusters, the catchment of each is not defined by district boundaries. In public service, there are 38 hospitals within 7 clusters in Hong Kong. These clusters are: Hong Kong East, Hong Kong West, Kowloon Central, Kowloon East, Kowloon West, New Territories East and New Territories West. Of these, there are 14 major hospitals which provide emergency services, and 3 psychiatric hospitals. In the private sector, there are 12 hospitals throughout Hong Kong.